Okomedyaki is a stand-up comedy show dedicated to bringing a true stand-up comedy experience to Tokyo… in Japanese. Foreign stand-up comedians doing their sets in Japanese, ensuring the Japanese audience not only have a great time, but an insight into stand-up comedy culture. BJ Fox is the main MC but there are a host of other great comedians who join him. 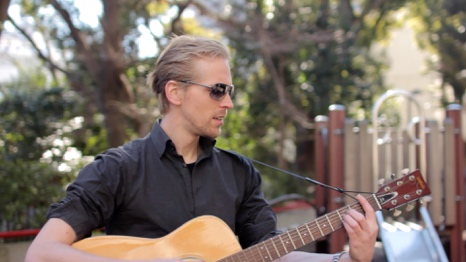 Ruben VM is a singer-songwriter from Holland, having spent some time in New Zealand. He has lived in Japan since 2010 to pursue his dream of connecting the world via music and laughter. Vinay Murthy is one of Tokyo's most established stand-up comedians, entertaining Tokyo crowds for many years in both English and Japanese. When not on-stage, you can hear Vinay as the voice of Mr Sandal in the hit anime, Sakura Quest.